www.nclcil.in. The last date to submit the application form through online mode is 12-11-2018. The candidates will be shortlisted based on the merit in written examination. The exam pattern and syllabus for the staff nurse and technician is comprising of Objective type questions for 100 marks and duration is 90 minutes. 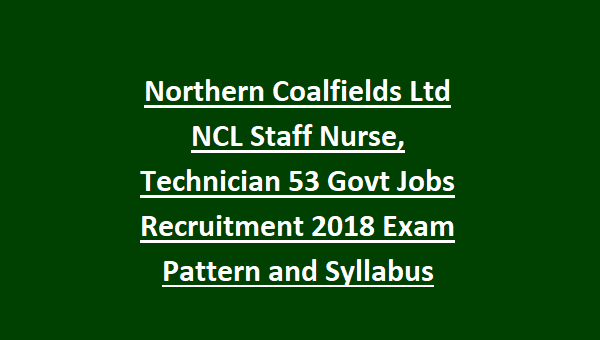 For More information of age limit, salary, educational qualification, application fee, exam pattern and syllabus and how to apply are given below for NCL Staff Nurse Jobs Recruitment Notification 2018. 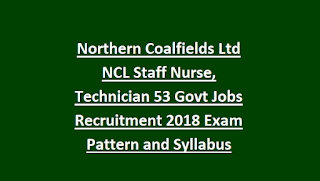 There are totally 53 available vacancies for Staff Nurse Jobs in NCL recruitment 2018. The upper age limit for the candidates applying for the Staff Nurse jobs is 30 years. For Staff Nurse Jobs – Candidates should have passed 10+2 and ‘A’ Grade Nursing Diploma/ Certificate (3 years course). Technician CT scan T & S Gr C (Trainee) – Matriculation Pass, Diploma in Radiology from AICTE and specialized training in CT scan for 6 months. Technician MRI T & S Gr C (Trainee) – Matriculation Pass, Diploma in Radiology from AICTE and specialized training in MRI scan for 6 months. The salary offered for the shortlisted candidates is Rs.31852/-. Candidates will be selected on the basis of merit in written examination/interview. The written exam will consists of 100 marks and duration will be 90 minutes for Staff Nursing and Technician posts. Interested candidates can apply through online official website of NCL is www.nclcil.in. The online application forms will be available from 08-10-2018 onwards. The last date for online registration and submit the application form is 12-11-2018. The last date of submit the hard copy of application form along with the relevant documents is 12-12-2018. Candidates can pay the application fee at the time of form submission. For more information candidates can check in the official notification.